If being the star for the evening appeals to you, have you considered wearing a satin dress shirt and tie combination by Daniel Ellissa. Satin dress shirts have that natural shiny appeal and silk look that simply works with evening wear for men or if you into Salsa dancing and want to shine. 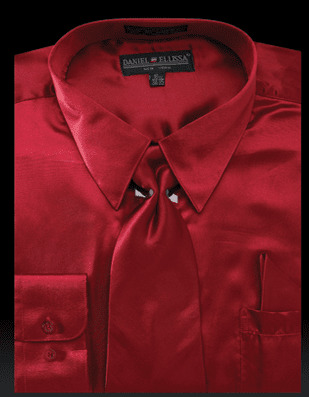 If you need a good shiny style shirt to wear with either a prom suit or a wedding suit, this burgundy color satin dress shirt and tie combination just makes good sense. Featuring the matching tie set and classic fit, this burgundy color satin dress shirt and tie set will help make you star of the evening. Fabric is Poly Satin which feels like fine silk. Need nice looking cheap formal wear, try a Tuxedo with flair. When you need them cheap, check out our entire selection of Mens Suits. Don't ignore style, embrace it with Stacy Adams Shoes.